Water based and quick drying, touch dry in 30 minutes, recoatable in 2 hours. Provides a tough and durable satin finish on all interior woodwork. Stains and varnishes in one. Approx coverage 12-15m2 per litre. 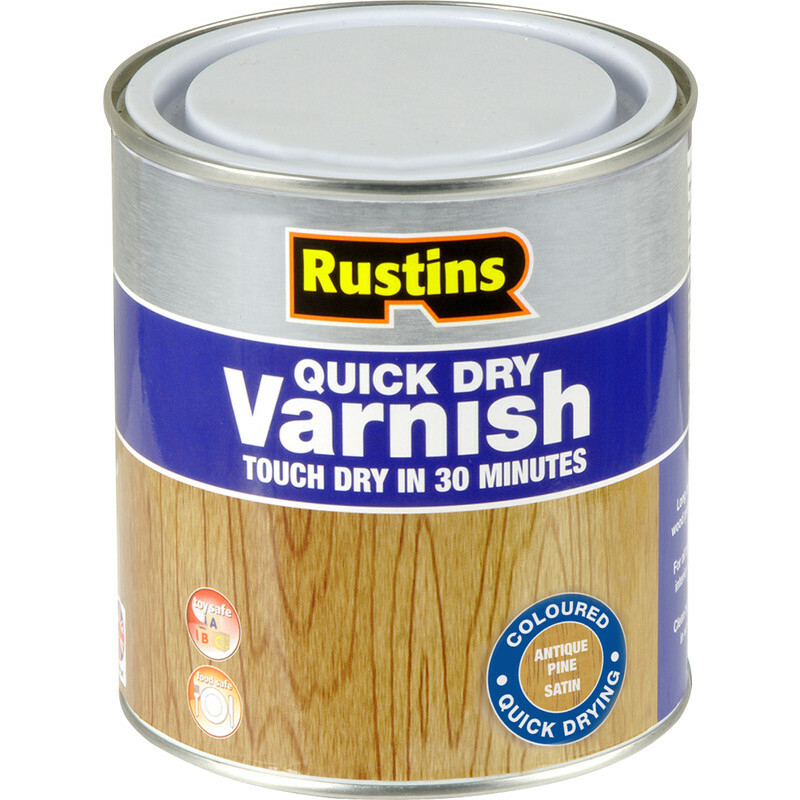 Rustins Quick Dry Varnish Satin 500ml Antique Pine is rated 3.3 out of 5 by 7. Rated 1 out of 5 by PhilAm from Not satisfactory Used for restoring a picture frame but result was rather a mess. Rubbed down between coats and applied carefully by brush but still wasn't able to achieve a good finish. OK I guess for workshop use but I'd stick to oil-based for anything needing a proper varnish finish. Rated 5 out of 5 by Peaches from Great stuff After light sanding applied 2 coats to an oak rug chest that had had a glass ring stain. Great finish very happy. Rated 5 out of 5 by Klatu from good results I have used this product on quite a few items off wood and results are good if you prepare surface ok easy to apply and dries very quickly so you can apply a second coat gives very good coverage. Rated 5 out of 5 by diydjs from Does what it says on the tin Easy to apply and very quick drying. Good finish. I bought it as it is "toy safe"
Rated 1 out of 5 by Rickj from Appalling stuff AVOID Nothing like oak colour ,not even near comes out very very dark oak nothing like colour on tin.Ignore instructions about over brushing otherwise you end up with ugly black lines as it dries too quickly.Shopped at toolstation for many years and this is worst product I've bought.